Mexican-American. A hyphenated American identity often ensures friction in oneself as a result of the internal pull of two cultures. One of the first journalists to cover this duality, Ruben Salazar, knew this feeling well. He was a writer whose identity was firmly established within American society but slowly became more conscious of his Chicano identity through his work—and became one of the most important Latino journalists in history for his observations of the radical Chicano movement in the 1970s. “Objectivity is impossible. And I don’t think there’s a newsman alive who really thinks that objectivity is the name of the game in the news media,” said Salazar in his last televised interview in 1970. Salazar had a unique position within American journalism. At the time not many Latinos were working within the mainstream media, and he was the first journalist to tell the nuanced stories of the often neglected Mexican-American and Latin community in East Los Angeles. The journalist was born on 3 March 1928, and soon moved with his parents from Ciudad Juarez, Mexico to El Paso. After graduating from El Paso High School in 1946 he attended the University of Texas and received a bachelor’s degree in journalism. He served in the United States Army in Germany for two years, and began his journalism career at the El Paso Herald Post as the first Latino reporter. In 1956 he worked in Petaluma for The Santa Rosa Press Democrat and after a year he switched to the San Francisco News. It was 1959 when he accepted a position at the Los Angeles Times. Salazar started out as a beat reporter, and became a foreign correspondent in Vietnam and the Dominican Republic, before he became a bureau chief in Mexico City for the rapidly expanding newspaper—which was was groundbreaking for a Latino journalist at the time. When he returned to Los Angeles in the 1960s, he became involved with the growing Chicano movement, which was about civil rights and empowerment, and turned his focus on the struggles of the Mexican-American communities. He highlighted problems that Chicanos were facing, among others: high unemployment rate, bad education, and restricted housing conditions. Salazar understood that the Chicano movement was an excellent tool to enforce change, challenge the status quo, in order to transform society. His account of the 1968 U.S. Commission on Civil Rights hearing in San Antonio Texas, “Stranger in One’s Land,” appeared as a commission publication two years later. Salazar’s astute observations made it an unique report which was published to broaden the narrative and stimulate public awareness for the problems confronting Mexican-Americans. In the late 1960s Salazar left the Times to focus his attention on the pioneering KMEX Spanish-language TV station—but he still wrote a weekly column on Chicano affairs for the newspaper. The hyphenated identity of being a Mexican-American became more and more important to Salazar. In his articles he highlighted the tension of the hyphenated existence in America. ‘A Chicano is a Mexican-American with a non-Anglo image of himself’ wrote the journalist in his 1970 article ‘Who Is a Chicano? And What Is It the Chicanos Want?’ As a journalist Salazar recounted the plight of the Latino in America, but then he went back to his suburban home and middle class life in Orange County, California. His background didn’t fit with his shifting perspective during the rise of the Chicano movement: the notion of his own identity in contrast with the inner tension of cultural assimilation. 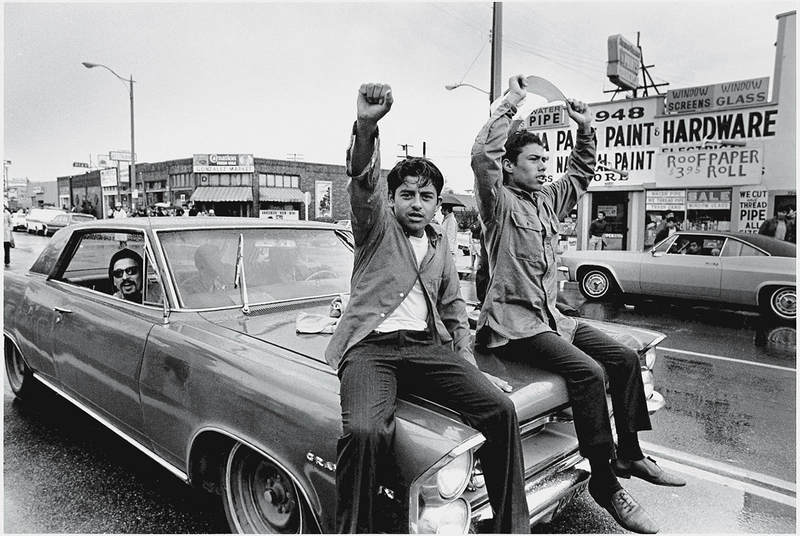 Salazar was covering the National Chicano Moratorium Against the Vietnam war, a huge anti-war demonstration in Los Angeles Eastside that drew around 30,000 people, on August 29, 1970. The marchers and the police clashed and the cops fired tear gas into the crowds. Salazar was covering the event when he took a break at the Silver Dollar Café with his team when he was struck in the head, and subsequently killed by a tear gas projectile fired by a sheriff’s deputy. Salazar was 42. His former employer, The Los Angeles Times, made an inquest but the investigation results were deficient. 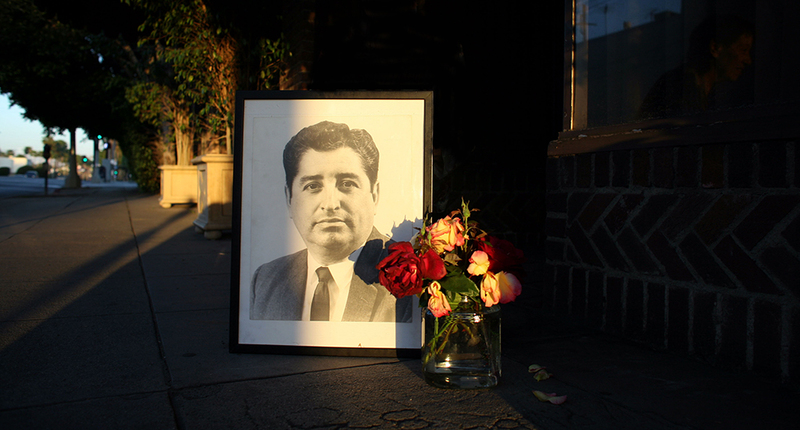 Suspicions rose that he was targeted by the LAPD and Salazar became a martyr for the Chicano movement. From parks, scholarships, to a US postal Service stamp which bears his name. The journalist was posthumously awarded by the Robert F. Kennedy Journalism Award in 1971. The California Chicano News Media Association established the annual Ruben Salazar Journalism Awards in 1999.